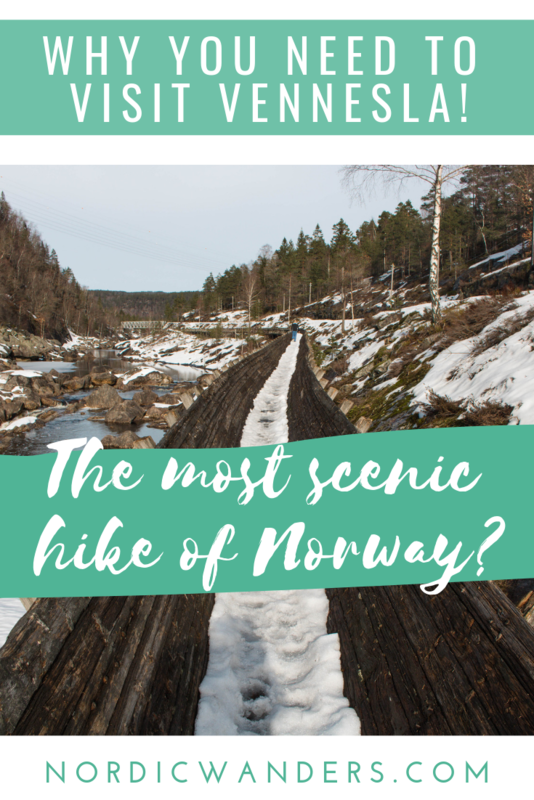 The small town of Vennesla in Southern Norway is not exactly very well known, yet it has one super unique hike to offer that justifies a detour to the Kristiansand area or your spending a day longer in Kristiansand than you had planned: the old log flume Tømmerrenna! 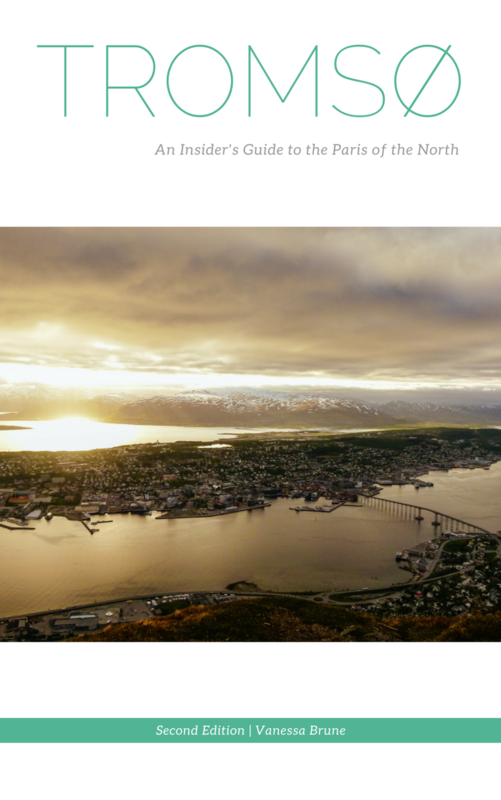 I’ve honestly never encountered a more exciting and stunning hike during all (so far it’s 5) years in Norway and I’ll definitely be back in Vennesla in summertime to do the hike all over again one day. Read on why the Tømmerrenna trail is a must when visiting Southern Norway! >> Reading on an RSS-reader? 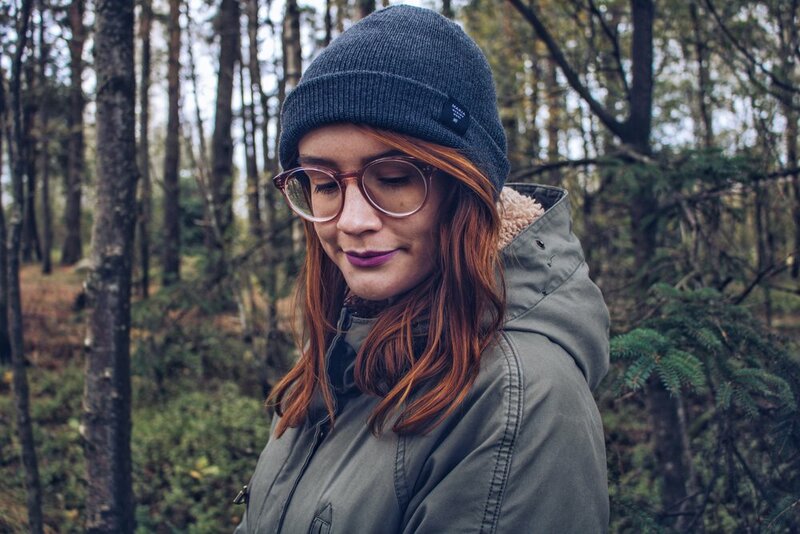 Click through to get to the original! Vennesla is a town of approx. 14.500 inhabitants, about a 30-minute drive (17 km) from Kristiansand in Southern Norway. Even though it’s so close to the city, Vennesla offers quite a different climate than sunny and warm Kristiansand, due to its location inland. While the average July temperature in Kristiansand is 20 degrees, it’s only 16 degrees in Vennesla. This average 4-degree difference is something I noticed on my recent visit as well. 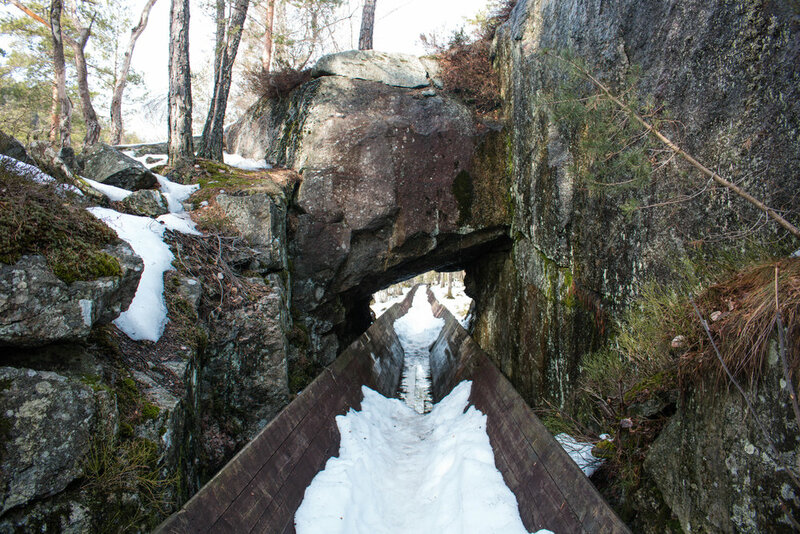 While Simon and I got to enjoy the first signs of spring in Kristiansand, there was still plenty of snow around in Vennesla and on the log flume trail itself. The log flume was established after WWII in order to transport timber from the forest down the river Otra. As the river on that particular stretch is characterized by lots of rocks which create rapids, transporting the timber on the river itself would have been impossible. Either the wood would have been damaged or there would have been log jams in the rocks. Hence, the log flume was created right next to the tracks of the old railway line Setesdalsbanen, established in 1896. The railway tracks are now used by veteran trains in the summer, meaning that you can first admire the scenery from the comfort of the train before embarking on a hike on the old log flume. The Tømmerrenna trail itself leads you on the wooden log flume, approx. 1 meter off the ground, through smaller tunnels and over a suspension bridge that might not be for you if you’re afraid of heights… It’s a gorgeous sight to look at, though, and if you walk over the bridge very carefully and on your own, you’ll only notice the bridge move very weakly, if that’s any consolidation! The stretch of the old log flume that’s still open for the public and thus, safe to walk on, is 4 km long (one way). The sign at the start of the hike says that you can hike the 4 km in 2 hours, so if you want to hike the entire flume and have a picnic along the way, you should probably plan in at least 5 hours. The Tømmerrenna trail is said to be doable year-round, however, having seen how much snow the area gets in winter, I can’t quite recommend it as a hike for January. Late February was fine as the remaining snow on the trail was already quite slushy but these things vary from year to year, so bring good footwear either way! Because of the snow, we only hiked the stretch to Paulen gård - an old farm that is now used as the base camp of the local pathfinder’s association. It’s a 1,5 km hike one way and we ended up spending an hour to get there (because of all the pictures), 1 hour at the farm to enjoy lunch, and 30 minutes to get back to the starting point of the trail. I’d imagine you’d only really need 20 minutes for this stretch of the trail in the summer, so maybe plan in 2 to 2 1/2 hours for this in total. The starting point of the Tømmerrenna trail is situated at Steinsfossen waterfall, just outside the village of Grovane, past Vennesla. There’s a parking lot available, but you can also easily get there by bus from Kristiansand. 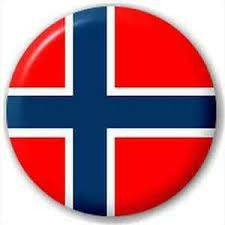 Just board bus 31 towards Vennesla in the city centre and get off at the stop “Grovane bedehus”. The journey takes approx. 30 minutes and leads you past stunning Norwegian farms - many of which still with the traditional colouring of a red barn and a white main house (white was an expensive colour in the olden days). From the bus stop you then simply follow the signs leading to “Steinsfossen” - it takes approx. 10 minutes to walk from the bus stop to the start of the Tømmerrenna trail. Note: The bus doesn’t go very often and even less so during school holidays, so make sure to plan your arrival and departure beforehand by means of the AKT Reise app. If you have a 1-day or 7-day ticket for Kristiansand, keep in mind that it won’t be valid on this journey as Vennesla is located in a different zone. You’ll have to get a ticket from Kristiansand to Vennesla and back. Warm clothes! As I said, the Tømmerrenna trail is situated inland and in a valley, which can be quite chilly. Definitely bring some woollen layers on a colder day, as well as a rain jacket and proper footwear. Even though there’s no incline and no rocks to be aware of, the log flume can be slippery when wet. If you decide to have a picnic at Paulen gård, bring some matches to light a fire (there’s a fireplace available but you’re not allowed to use it during the summer for risk of forest fire!) and some insulated pads to sit on. The farmhouse itself is closed and there are no restrooms anywhere close by, so it’s off in the woods you go… Please do clean up after yourself and collect any trash to throw away in the nearest trash can after the hike. Last but not least, you should bring enough water and snacks, as well as a fully charged battery for your camera - you’ll need it! >> Watch my travel vlog for more impressions of the hike and don’t forget to subscribe!